The Asociación Pro Mejoras de Playa Tamarindo (APMT) continues working on its programs to promote the betterment of the community for both residents and visitors. During 2008, the APMT went through a phase of cost reduction that affected its most visible part. The office was closed, and the position of Executive Director had to be eliminated. However, this does not mean that their programs were cancelled. APMT still kept cleaning the beaches, and financing the police and lifeguards programs up to this day. For several months, they steadily worked on these programs, as well as on constituting the Board for the next term. In January 2009, the Assembly was convened to appoint a new Board, which had to face a quite poor picture. On one side there was the global crisis; and on the other side, developers were concerned about the pronouncing of the Sala Cuarta, in which every construction within the first 500 meters from the beach was halted in order to protect the leatherback turtles. The crisis led to a significant decrease on the contributions of 150 memberships paid last year to less than 20 in the current period. Only the annual basic cost of the office is of $18,000.00, to that let’s add $36,000.00 for the management of the programs. Three urgent needs are in danger of disappearing: the cleaning program for Tamarindo to have a decent appearance for residents and visitors; the lifeguard program that ensures the safety of tourists in the sea, and the permanence of the Police, whose work is of vital importance in the area. The government has not supported the programs and the way to collect this money through the state institutions is never-ending. However, the association has continued with the requests of support to the ministries and the Municipality, while keeping calling for donations for them not to depend on the contributions of residents. In addition, the “plan regulador” rests at the National Institute of Housing and Urbanism (INVU, in Spanish). The plan will not be processed until settling the $7000-debt owed to consultants who participated with APMT and the municipality to carry out this project. Bruce McKillican gave its own version. His position is interesting because he is both resident and developer. “Only a small percentage of people pays; others do not do it because they disagree with the programs. I am sorry that APMT does not have a good relation with the Municipality. I personally think that there is a serious disconnection between the needs of Tamarindo and the Municipality’s. We, the residents of Tamarindo, are daily paying basic services from our own wallets. The garbage collection, the lifeguard program, the presence of Police officers are all paid from voluntary donations allocated to a tourist destination. The money from tourism generates taxes. But such monies will never come back to Tamarindo. That is out of balance. That is Pro Mejoras struggle”. Business owners, residents and major investors must be aware that the police, lifeguards and cleanup of Tamarindo are essential to their interests, and ask themselves if they are making their own efforts to preserve them. Finally, APMT has a new website (www.apmtcr.org) to keep the communication with the community. Here you can find all relevant documents to each program, as well as information that has been collected over the years. Currently, the site is only in English but in a few weeks the Spanish version will be published. For more information, please email info@apmtcr.org. Account numbers for donations or memberships are: # 200-02-145-000762-7 at Banco Nacional and # 907345920 at BAC San José. Costa Rica's Central Bank is reporting positive signs of an economic rebound. Costa Rica may be riding above the deep economic flood that’s washed over other developing countries. “Recent years of good (gross domestic product) GDP growth and prudent fiscal policy helped reduce the public sector debt burden to less than 40 percent of GDP in 2008, down from more than 50 percent in 2006,” according to the report. Costa Rica’s Central Bank also is reporting positive signs of an economic rebound, including a moderation in the rate of economic contraction and an increase in retail sales for the first time in three months, according to a recent report by the consulting firm Aldesa. In addition, major foreign investors such as Boston Scientific and Firestone recently have undertaken actions to expand their operations in Costa Rica. Yet, the picture isn’t as hopeful on the world stage. The World Bank issued a warning on Thursday of the lasting impact the crisis could have on developing countries. “Although growth is expected to revive during the course of 2010, the pace of the recovery is uncertain and the poor in many developing countries will continue to be buffeted by the aftershocks,” said World Bank Group President Robert B. Zoellick. This was the first official meeting with AYA to inform the community after AYA took over the water Service from Beko S.A. Many residents had been upset about the high water rates from the past and AYA explained that it was a difficult transformation as they where not prepared and Beko did not cooperate at all. They presented their new service and the responsible people from AYA for the Tamarindo area and informed about the past and the future plans. Good news was that the high water rates established by the former water Service Beko are currently reviewed by the government institution ARESEP and within about a maximum amount of 1 month a decision will be made. Also the high rates charged for a new water connection is over. AYA has fixed rates depending on the location and circumstances from about US$25 to a maximum of US$180. Further more an investigation made on the former Beko Service that they have received more then US$2,200,000 for water hook ups from residents and developers in Tamarindo. On the other side some of the water meters who require to be replaced after 3000 cubic meters in order to be accurate, had a total of more then 20,000 cubic meters. This is over now and the meters will be replaced as needed. Beside that water will now be tested frequently ever month to insure good quality. More good news are that 5 beach communities like Jaco, Manuel Antonio and Tamarindo, beside others, have received some studies in order to build a black water treatment system. The project looks like well on its way, the study for Tamarindo is already completed and if all goes well the project could start in 2010 to be finished in 2011. All financed by the Bank from the Government. Any project from small to large can take quite a while living in Costa Rica. It’s the downside to living the laid back easy “pura vida” lifestyle. Recently however, the Government under the Arias Administration has been able to somehow stimulate the growth of infrastructure in the country. Things seem to be moving more smoothly and delivery dates of Government funded projects seem to be more accurate with their completion. In San Jose there has been expansions of major roads systems in some of the most congested parts of the city. Toll booths have been constructed with “E-Z Pass” technology; a capability where an electronic toll collection system uses a small radio transponder mounted in or on a customer’s vehicle to deduct toll fares from a pre-paid account as the vehicle passes through the toll barrier. This reduces manpower at toll booths and increases traffic flow and fuel efficiency by reducing the need for complete stops to pay tolls at these locations. While technologies like these are far from reaching our little beach town, (most likely & hopefully never) we are seeing much advancement in the paving of our roads. The main road of Tamarindo was completed last year and till this day we can still appreciate the great job that was done. For six years now, our beach community has been highly anticipating the paving of the main road to Langosta, which is finally underway! At least as of June 1st, 2009 it appears to be. In front of our office we noticed the rigorous work involved in filling in the new Tamarindo Lake which formed with the past couple of downpours. Pacific Park was soon to be renamed Lakeside Park. Fortunately this issue has been solved and by the looks of it, it is the first stage of the project of paving the road all the way to Langosta. We have received from a reliable source the time period in which this strip of road shall be completed. According to the project manager who works directly with The Ministerio de Obras Públicas y Transportes (MOPT), the road will be finished in 1month…yes 1 month. I’m sure many of you also found this amusing, yet the source of the information should be taken a little serious considering his position. But we all know that even if the President of Costa Rica announced the road would be finished in 1 month we STILL wouldn’t believe it until we kneeled down and felt the asphalt with our own hands. There’s always hope though when we see something is being done. 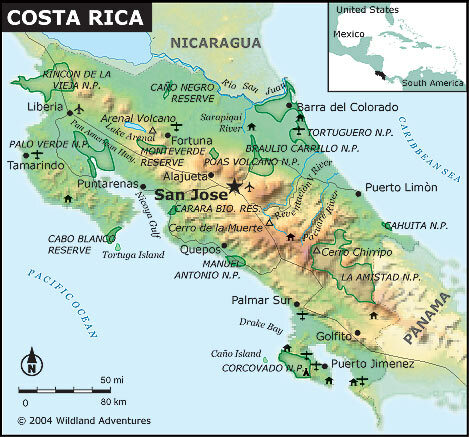 A World Bank Institute study ranked Costa Rica as the safest country in Central America. The investigation, which results were announced through the Foundation For Development, located in Guatemala, studied 209 countries in the world; and ranked Costa Rica in position 47 of the list, highest than all the other countries in the region.